Before Jason’s Deli began, our founder, Joe Tortorice Jr., had great service at the forefront of his mind. Since the early days when Joe helped his father in their sandwich shop, J’s BBQ & Washateria, he has been inspired by serving others. In 1976, When Joe ventured out on his own and opened the very first Jason’s Deli in Beaumont, TX, he maintained that mindset of always putting the customer first. This is why we do everything in our power to improve the lives of others. Need a high chair? You got it. Don’t like onions? No problem. No time to come by the deli? That’s okay! We’ll bring the deli to you. In fact, we’ve been delivering for more than 25 years. 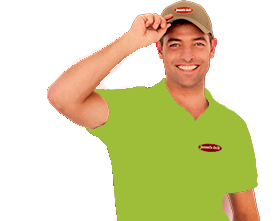 We staff our own delivery drivers, so you know every delivery will meet our high Jason’s Deli standards. We’ve got your back; every delivery, every day. We’re committed to providing out of this world hospitality, including deliveries, with a warm smile and helping hand. P.S. We would love to deliver your next meal. Check to see if delivery is available in your area by clicking here. *Delivery minimum is $25 and delivery fees may vary by location.